A few months ago, in an attempt to try to get Sadie to stop trying to convince each and every priest she comes across that she's old enough to receive communion, I explained to her that someday, when she was much bigger, she would wear a beautiful white dress and a veil and then she would be able to receive. This morning she woke up in a mood. I'm not sure how someone can sleep twelve consecutive hours and wake up yelling: "I want to sleep" when everyone else is getting up, but that was where we were at 6:45 this morning (not an unusual wake up time for us, if it's anything, it's about 45 minutes later than normal). She stomped out of the room and burst into tears when I suggested she eat breakfast before getting dressed. I could only imagine what Mass was going to be like. Still, after breakfast when I pulled out her two fancy Church dresses and gave her a choice, she perked up instantly. She excitedly picked out her Easter dress, which happens to be sparkly and white. Then, when I went to pick out a snood for the day she happily took her veil and began modeling it in the mirror. It's a veil that I bought for her years ago, and it's ridiculously large, falling all the way down her back, but I think that only makes her love it more. As she cheerfully walked across the parking lot towards the chapel I reminded her that, despite the outfit she had happened to pick out, she was not big enough to receive. She looked at me, smiled and said: "Best behavior, right Mommy?" before we walked through the front doors. Now I have a confession to make. As an adult convert I clearly remember when RCIA candidates are usually confirmed, but if you'd asked me when first communion took place I would have had no idea whatsoever. I might have been able to guess spring, but I'm not totally sure I would have even figured that out. So it wasn't until the homily when father mentioned first communion that I realized that it was apparently this weekend and Sadie had managed to leave the house dressed like she was ready to go. I could just see where this was going (tantrum in the near future anyone?). Thankfully, though, today was the rarest of all days. Sadie and Mae, for the first time in approximately 22 months (Mae's age) both sat nearly silently for all of Mass. I was planning on writing a bit more, but it's 9:31 and my eyes are barely open right now... so I think I'll have to call it a night. 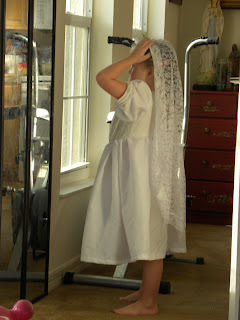 No, First Holy Communion was not yesterday. Father just announced that the girls who are First Holy Communicants-To-Be would be bringing up the crown and placing it on Mary for the May crowning. The kids will actually be receiving First Holy Communion on June 10th. Most places have it sometime between April-June with May being the most common month. Father likes to do it near the Feast of Corpus Christi (the Body and Blood of Christ) which is why he is having it in June. Typically kids received FHC in 2nd grade or sometime after age 7. I wondered about that. I figured it was just taking place at another Mass. So it isn't just a set date (that's probably why I could never figure out when it was, I've seen a steady stream of pics on facebook from various friends around the country). I keep reminding Sadie that she has quite a ways to go, but it doesn't seem to be sinking in. She's just so hopeful! They were so sweet bringing up the flowers! It was beautiful! No FHC is not a set date. Each priest/parish picks whatever date they want. With Fr. Austin it is a bit different than if you are going through an actual parish. Since there are only 4 kids in the class, he gave us the option of doing it either on the Feast of Corpus Christi (which is on a Thursday up in Sarasota at Christ the King), or on the following Sunday down here in Naples in the chapel. Fr. Austin is having the kids make their first Confession the Sat. right before, however, different places do that differently. When Heidi had FHC, she had her First Confession in Feb. and had her First Communion in early May during a Sat. evening Mass. It really is just up to the individual priest/parish. Occasionally kids can make FHC earlier than 7, if they are really ready and prepared and have the maturity to understand the Eucharist and sin and personal responsibility, etc. Understanding sin is actually the harder part for kids to grasp. They generally don't have a problem understanding the Eucharist, but understanding personal sin and the difference between things such as lying vs. being mistaken or an accident vs. an intentional action is a bit trickier. Kids tend to get confused about the difference between intentionally pulling the cat's tail vs. accidentally stepping on it, and some kids have an easier time with this than than others. However, since they need to have first Confession before they get FHC, they need to understand sin first. 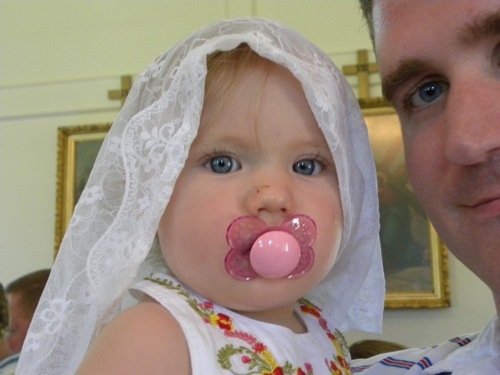 But some priests will let you make FHC at age 6 if the parents and the priest feel the child is really ready for it and had the proper understanding, so when Sadie gets to be that age, if you think she is ready, you could talk to a priest about possibly doing it earlier. I leave you this link in case you'd never heard of little Nellie. What a beautiful saint, and something tells me would be very near to your daughter's heart. She's the reason I kiss Vincent on the lips upon reception, myself. Blessings to her little heart. What a strong example she is to her sister!